The North Fork of the Siletz isn't the hardest run around, but it is a long way from anywhere, which lends a great deal to it's appeal. 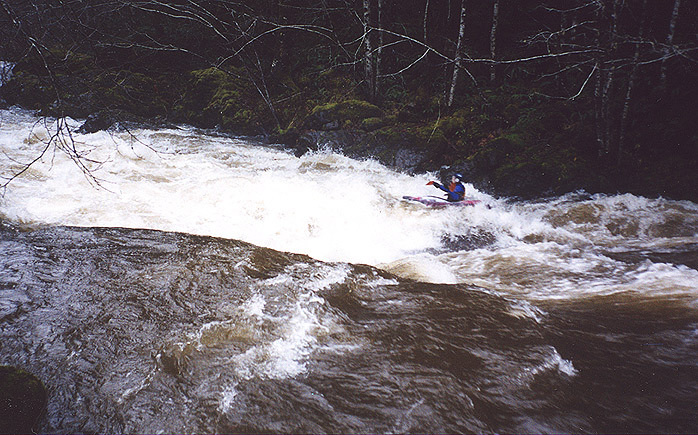 This run is located deep in Oregon's coast range, so bring a good map and a sense of adventure. We finally got around to this river after the first big rain event of the year (midway through December, much to our dismay). The coast range was getting pounded with rain, so off we went..
After a bit of driving we passed through the town of Falls City, and stopped on the north side of town to check out Big Luckiamute Falls. The last time we had scouted this drop (at much lower water) it looked awful, with rocks sticking out inconveniently all the way down into the landing zone, and much of the water plunging lethally against the river-left wall. 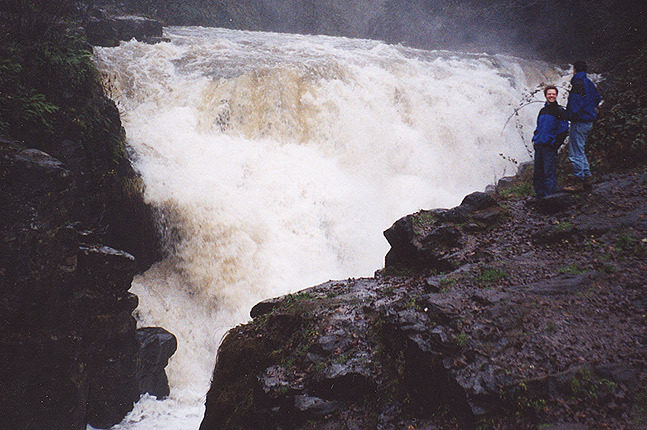 At high water the falls still looked bad, full-on class six with a very high injury or death potential. So much for it cleaning up with more water! We pondered this drop for a few minutes, then the rain intensified so we jogged back up to the cars. After a half hour or so we arrived at the North Fork confluence. None of us had ever done the river before, so that made it even more interesting! The road closely paralells the river most of the way up, allowing ample opportunity to scout the major rapids. We were pleased to see that the river was all cranked up and in the trees, with several thousand cfs ripping downstream, big and muddy and full of debris. (The Siletz Gauge was around 6300 cfs, or 9.3 feet). All of the drops looked good until we arrived at a ledge about a mile below the put-in. We had heard about a 'huge, terminal hole' forming at this ledge at higher water, and we were all pretty impressed by the sheer scale and nastiness of the thing. I think the hole at the bottom of this ledge was one of the biggest I have ever seen on a river, at least 30 feet wide (maybe 40?) with a totally uniform recycle of epic power and proportion. "Jesus, look at that thing" I said as we gaped wordlessly at the hole. "Ummmm.. Portage..."
Pete and I immediately headed upstream to locate an eddy (because the river was really ripping along, with few places to stop). We found places to stop safely, and then discussed the importance of getting swimmers out above this drop at all costs, because a swim over that ledge would likely be fatal. Jesse spent a long minute looking at the ledge, then decided that he was going to run it, going with the flow through the meat of the hole. 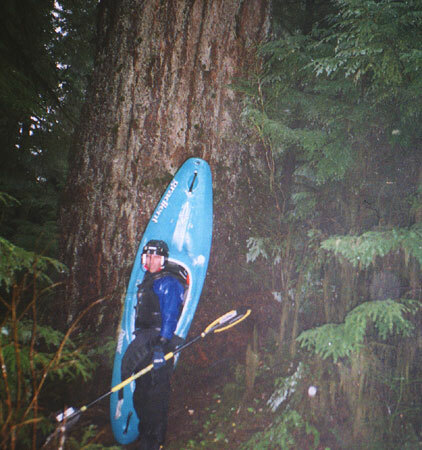 I must admit that I would have been skeptical if I had never boated with him before, but after our California trip I knew he'd probably pull it off..
Pete, dwarfed by a massive old growth tree on the hike down to the North Fork. Well, we knew the river would be high, but when we got down to river-level we were impressed nonetheless. Up here the river was much narrower, and there were very few eddies to be seen. We immediately noticed a couple of logs on the bank, and we were a little concerned about being able to stop if we encountered a logjam. I put in and rounded the corner, and was dismayed to discover an old growth log spanning the stream a hundred yards below me. I quickly scrambled into an eddy, then listened as Pete yelled verbal instructions from his scouting vantage on river left (he had hiked downstream to check the wood before putting in). I made another desperate ferry across to river left just above the log, then we ducked under it and were swept downstream. Fortunately we didn't encounter any more wood, but the upper section was very exciting with this much water; once we reached the main stem of the North Fork and several more creeks doubled the flow, we were really moving. Soon enough we arrived above the ledge and we scrambled into eddies. Jesse and I got out on the left (on the road) while Pete went down to set safety on the right. Soon enough Jesse came ripping downstream and took a huge powerstroke as he dropped into the belly of the beast. 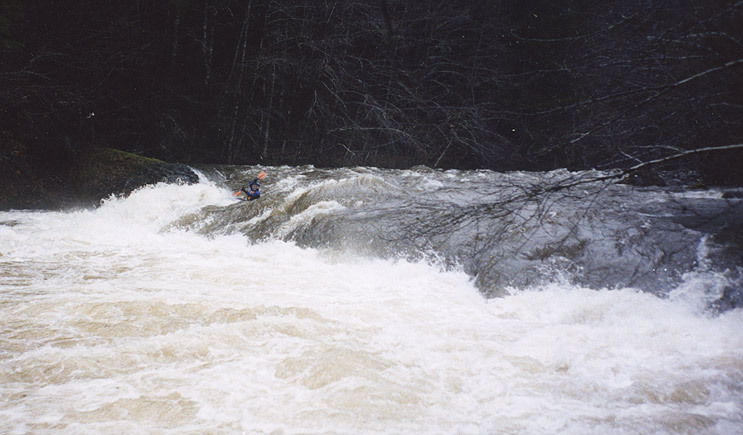 He disappeared briefly and we held our breath as the river continued to thunder into the hole in his wake, until he popped up a second later, got sucked violently to the left and then back as he paddled furiously for a second or two, then he was free..
Jesse goes for the gut through a massive, terminal hole on the first major drop on the North Fork. This is one of the biggest holes I have ever seen anyone intentionally paddle into. Downstream were a long series of exploding waves and excellent playspots, and we all decided later that this main stem of the North Fork would make for a good playboating run at this flow for solid class IV-V boaters. 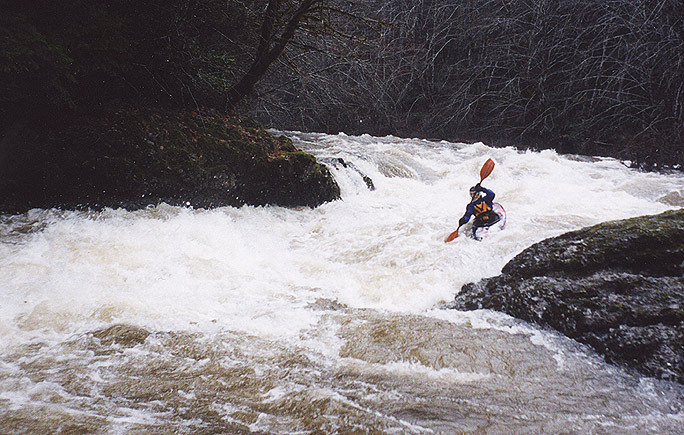 On the other hand, I would like to go back someday and see what some of the rapids look like at regular flows, because they were all filled in on the day we paddled this stretch..
Jesse skirts the shoulder of another large, violent hole. I think this drop is the 'mini-gorge' known as 'Bombshell' in the guidebook, but the gorge was all filled in on this day..
Jesse lines up on another sizable hole in the last rapid above the take-out on the North Fork..